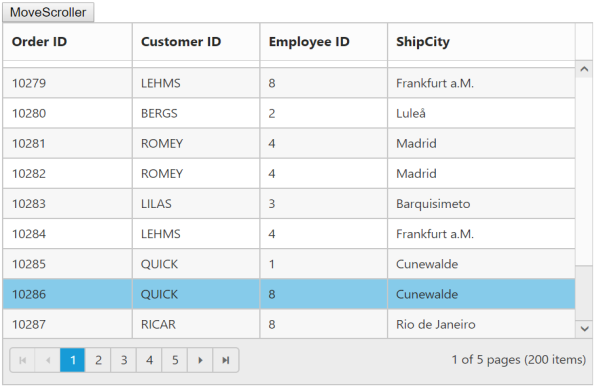 This Knowledge base explains how to scroll the Grid scroller programmatically. We can achieve this by using getScrollObject method of ejGrid and scrollY method of ejScroller. The getScrollObject method returns the instance of the scroller object. In scrollY method we need to pass the integer value to move the scroller. In the below given solution we have moved the grid scroller to the end of the Grid based on the length of the current view data and row height. 2. 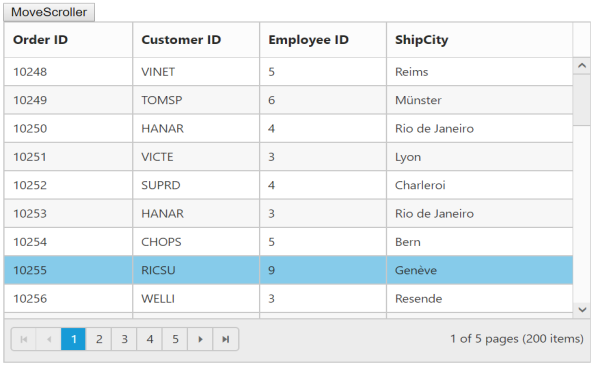 In a button click event we have obtained the instance of grid scroller using getScrollObject method. Then we have moved the scroller to the end of the Grid using scrollY method based on the values of row height and current view data length.